Judge Lucy Koh has given Samsung a huge discount on the damages it owes Apple. 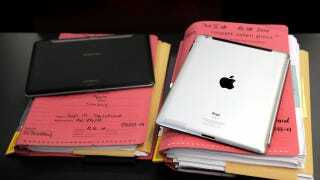 Originally billed to pay Apple over $1 billion, Judge Koh has cut $450,514,650 from Samsung's tab. The new total that Samsung owes is $598,908,892. Still an unfathomable amount of money but an unfathomable amount of money less now. "The jury based its award on the notice date provided by Apple, which Judge Koh now believes was too early because only one of the patents, the rubber-banding patent, had actually been listed in a presentation Apple gave to Samsung in 2010."